Ostrich Feather Dusters are the natural, chemical free, anti-static choice. A plume of millions of separate, wispy barbs collect the dust, rather than just move it about. To release the dust, a quick shake is all it takes. The Cherry Heaven duster has a 1.4 metre telescopic aluminium handle, so you can reach the ceiling, coving, picture rails, and bookshelves. They're very soft and light, so can be used for, and between, delicate objects. Ostrich Feather Dusters were presented to the contestants on Anthea Turner�s Perfect Housewife show. 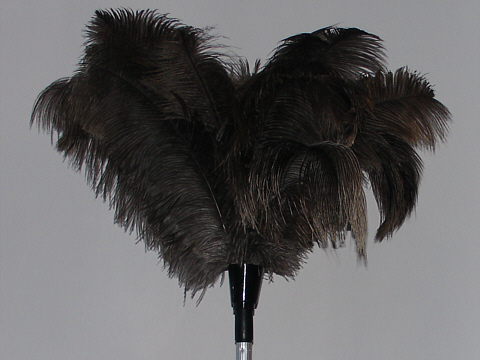 The Ostrich Feather Dusters are made from premium-quality natural-colour feathers. Occasionally, the feathers can be washed in warm soapy water, rinsed, and air dried.